Item # 265754 Stash Points: 11,999 (?) This is the number of points you get in The Zumiez Stash for purchasing this item. Stash points are redeemable for exclusive rewards only available to Zumiez Stash members. To redeem your points check out the rewards catalog on thestash.zumiez.com. 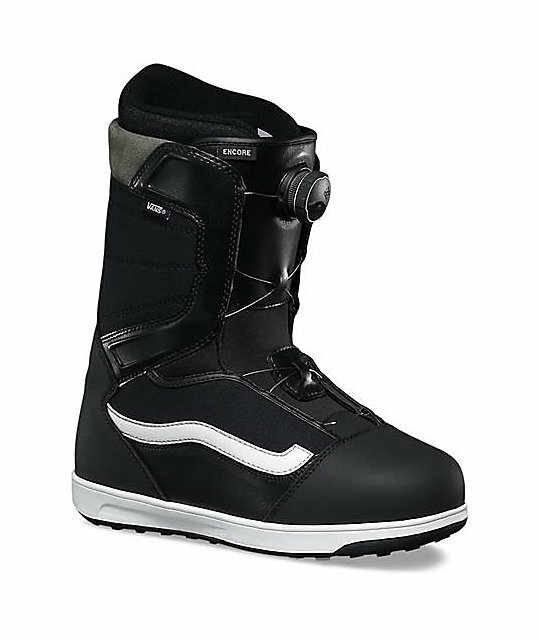 The perfect out of the box boot, the Vans Encore Boa Black & White Snowboard Boots were designed for the snowboarders who appreciate getting the most bang for their buck. Focused on a simplistic construction, the boot features a Boa Coiler Closure System paired with a Flex Liner for a dialed-in fit without a break-in delay. Equipped with an Internal Wrap Harness for advanced support, the Encore Boas will keep your limbs nice and snug while still offering great flexibility. 2017 Encore Boa Black and White Snowboard Boots by Vans. Flex Liner for a dialed-in fit without a break-in delay. V1 Footbed designed with the same reliable comfort technology found in Vans footwear. Reverse Waffle Outsole that fights fatigue, absorbs impact, and optimizes feel and control. Internal Wrap Harness for advanced support. Instep Flex Zone Technology for maintaining flex, even when strapped into bindings.